Imagine a stray, hungry little poodle dog being picked up by Animal Control, and her elderly age and severe ear infections landing her on the kill list. This same little dog is today Animal Hero Kids´ most loving volunteer, and she visits schools with me and helps to surprise animal hero kids with awards, she has been featured on national television shows and news. 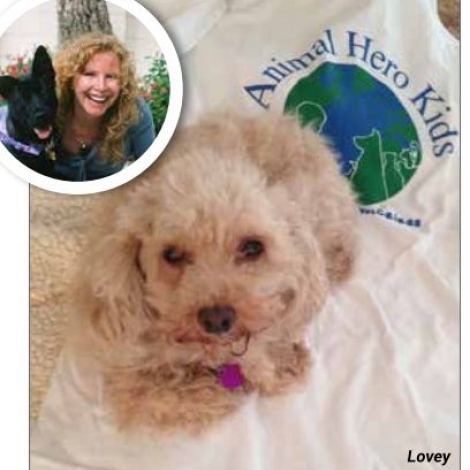 Here is an excerpt from the "Animal Hero Kids Voices for the Voiceless" book about Lovey and two amazing twin sisters. Animal Hero Kids is an all-volunteer organization and one of our biggest supporters is without a doubt Lovey Hargreaves. Lovey was a stray found wandering in Wellington, Florida. She had ear infections, was very thin, and her coat was matted and dirty. The Palm Beach County Animal Control is an open admission shelter which means they cannot say, ´we are full, we cannot take any more dogs and cats´, this results in many animals being euthanized. Nationally, approximately 4 to 5 million companion animals are killed each year in shelters. When I visited the shelter, it was very hard for me to pick just one dog, there were so many dogs and cats I knew were scheduled to be killed. My purpose was to adopt to save a life. Lovey joined our family of 6 rescued canines and felines. One of her dog brothers, Connor weighs 110 pounds and his head is bigger than Lovey’s whole body! He is so gentle with her. Animal Hero Kids’ direct humane education presentations promoting being kind to all animals reaches 30,000 children and adults each year. If a program or award presentation is not too loud and I know Lovey will be comfortable, Lovey will come to the schools with me. If I am holding her, Lovey is fearless and feels secure. She needs to know I am not going to leave her behind and she will not be lost again. Whenever I walk in to a school room with her, all eyes are on Lovey. A reporter visited the house and the photo she took of Lovey ended up on the front page of the newspaper. In the photo, Lovey is looking at an enlarged photo of herself on the side of the Compassion Cruiser car, the car I use to visit schools and spread the message of kindness to all animals. Lovey and I surprised twin Sisters Alexandria and Sidney Cohen during a school assembly. Lovey and I were doing a presentation about how everyone can be heroes to animals and the sisters we surprised were in the student audience. • Blend two heaping tablespoons of peanut butter and a cup and a half of your plant milk of choice, soy, coconut, rice, or almond milks. • Pour mixture in a bundt cake pan and add seedless watermelon bite size pieces or any size cake pan including a cupcake pan. • Freeze and eat outside or take to the park or yard and if you have been good maybe treat yourself to a little refreshing taste yourself!